Why time slows down when it is on “regular time” instead of “daylight savings time”. Why if there is a hole in the big toe spot on your sock and you put the sock on the other foot, the hole is still at the big toe. Where all the leaves go in the fall. (There really should be huge piles somewhere). Why you have never met “somebody” and “nobody”. Why one day time stands still and the next zips by. Why you forget what you want to remember and remember what you want to forget. Why the good ole days seem so good. How a spider gets the first string of the web from point A to point B eight feet away. Why you always seem to end up with the crust of bread. Why yawning is so contagious. How a bird knows when and where to migrate. How a hummingbird remembers the address of your house. Why in the world you dream what you do. Why the best sleeping is after the alarm clock rings. It always makes me smile when I see someone wearing a t-shirt that says, “I love my church”. In four words I have just learned that this person belongs to a church fellowship that cares about them and is dynamically invested in people and faith. David, the Psalmist, said, “I was glad when they said to me, let us go into the house of the Lord” (Psalms 122:1). In Old Testament times, there was only one place to worship. Jerusalem. At the appointed times, as directed by God, people would gather and travel together in large groups to the tabernacle to worship. For many the pilgrimage covered many miles and as they walked they would be joined by others. It was a fun, festive time of talking, reconnecting and singing. Their love for their church was showed by the spring in their step and the joy on their faces as they set their faces towards Jerusalem. Recently our pastor preached a sermon on “Thankfulness for the Church”. This Thanksgiving season I want to express my gratitude for my church, Powhatan Mennonite. It is that one special building whose doors I pull open every Sunday and walk inside. It is a haven that refreshes my spirit after a week of work. It is a community where I can share my joys, fears, concerns and grief. It is a fellowship where I am comfortable to worship with other believers and seekers. It is a church family that I know and care deeply about and they for me. But most importantly, my church is a place where I meet God. For me going to church is something I look forward to every week. I anticipate and prepare for Sunday. It has been a part of my weekly routine since I was born 63 plus years ago. I am blessed that my parents always went to church; we never missed a Sunday unless we were sick or it snowed. It was not a “negotiable” activity. If the doors were open, we were there. When Gene and I were married we had to make a conscience effort to keep this a priority for our family also. Going to church may be a habit but it is a good habit. We know, without question or discussion, that this is what we will do every Sunday. We are not legalistic about it but we have determined not to let anything become a routine excuse not to go. 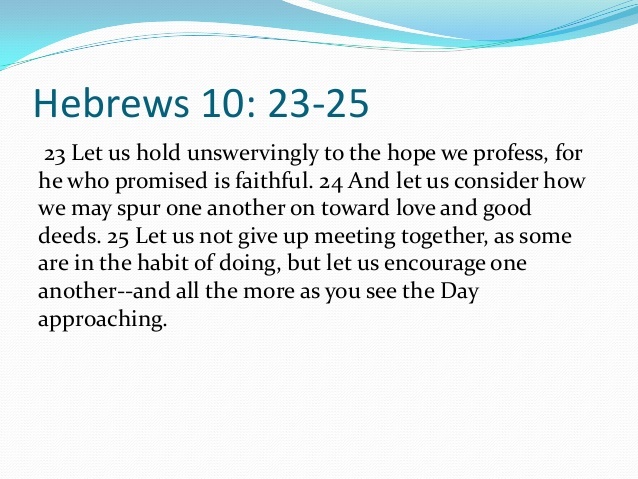 Paul gave believers a challenge to preserve in gathering together…. Together at our church we worship, learn what it means to be people of God, pray, fellowship, and care for others. Sometimes we laugh, cry, grieve, help, play, and even eat together. Today our church sign reads…. This Thanksgiving season I want to say, “Thank you God for my church. You are good and I have experienced Your love through my church family”.